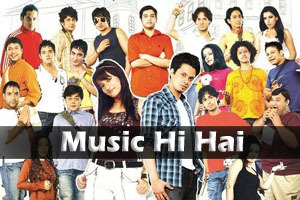 Lyrics Of Music Hi Hai Mann Ko Mehkaaye From Movie - Admissions Open (2010): Nice playful song sung by Kavish Seth, Kavita Seth & music composed by Amit Trivedi. Star Cast: Anupam Kher, Aashish Vidyarthi, Ankur Khanna, Pramod Moutho, Rati Agnihotri, Sudesh Berry, Master Abhishek Sharma, Arshi. Lyrics of "Music Hi Hai Mann Ko Mehkaaye"
Lyrics in Hindi (Unicode) of "म्यूजिक ही हाय मन को महकाए"